It's official. Gary Hamel is a genius. I posted just the other day about one of his best-known books "Competing for the future". I'll post soon about his most recent 2007 book "The future of management" which challenges management as we know it today. It's a great read. 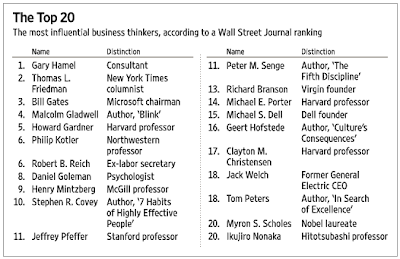 That aside, according to the Wall Street Journal - based on Google hits, media mentions and academic citations - Mr Hamel is ranked business guru No. 1.